Dr Bookspan is a military researcher. Harvard School of Medicine clinicians have named her “The St. Jude of the Joints.” A degenerating disc, or one that is slipped (herniated) can be painful and frightening. Despite the fact that discs usually can heal quickly and easily, people are commonly told that a disc problem is a difficult and long-term condition.They are told to accept and “live with” pain and reduced ability. They may stay on pain and anti-inflammatory drugs for long periods. Recent news reports from Time Magazine and The New York Times quote spine specialists as saying that back pain is mysterious, and that commonly used modalities like acupuncture, strengthening, surgery, massage, chiropractic just aren’t working. However, the case is that back pain is usually simple to understand, and simple to fix without surgery or special beds or equipment. People do an astonishing number of things every day to strain, weaken, and pressure their backs. You know you shouldn’t lift wrong, but you do — all day, every day — picking up socks, petting the dog, for laundry, trash, making the bed, looking in the refrigerator, and all the dozens of times you bend over things. You work bent over your desk or bench. You drive bent forward. If you go to the gym, you probably lift weights bent over, stretch by touching your toes, do yoga by bending over at the waist, then bend over to pick up your gym bag to go home. No wonder your back hurts. Most people know that bending wrong will injure your back. But they stand, bend, sit, and lift wrong many dozens of times a day, day after day, then compound the problem with holding muscles tightly, and doing bad exercises. They may do special “back exercises,” but not be aware that strong muscles will not automatically give you good posture, make you bend and lift properly, or make up for all the things you do the rest of the day to hurt your back. They wonder why they still get pain even though they take their medicine and “do their exercises. 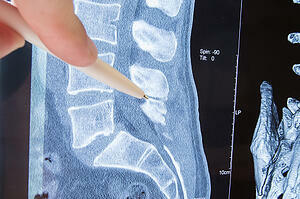 Discs are little fibrous cushions between each of your vertebrae (back bones). You have discs in your neck, the middle of your back, and your low back. You also have two discs in each knee. A knee disc is commonly called a meniscus. You even have a little disc between your lower and upper jaw bone at your temporo-mandibular joint (TMJ). Discs are living parts of your body. They do many things like absorb shock, and keep your bones from grinding against each other. When you abuse them by bad habits, they can break down. Years of forward rounding, squashes your discs and pushes them out toward the back. The discs eventually break down (degenerate) and push outward (herniate). Think of a water balloon. When you squeeze the front, it bulges toward the back. The resulting herniation can press on nearby nerves, sending sciatic pain down your leg. Or if you squash and push the discs in your neck with a forward head posture - letting your head tilt “chin-forward” instead of holding it up straight, the disc in your neck may herniate and press on nerves, sending pain down your arm. Tight muscles from years of poor positioning and short resting muscle length can also press on the same nerves mimicking sciatica. Chronic forward bending (flexion) also overstretches the muscles and long ligament down the back, which weakens the back, and pushes vertebral discs posteriorly. The pressure of your own body weight on your muscles and discs over years of poor sitting, standing, and bending habits is enough to injure your back as badly as a single accident. Think of braces on your teeth. After years of pushing, things eventually move. An unfortunate situation is that someone with a slipping or degenerating disc is often told they have “degenerative disc disease” or “disc disease.” But it is not a disease. The condition was misnamed. A hurt disc is a simple, mechanical injury that can heal, if you just stop grinding it and physically pushing it out of place with terrible habits. Forward bending gradually pushes discs out to the back. Lift and bend properly to avoid pushing your discs out of place. Sitting with lower back rounded can eventually push low back discs out. An unfortunate situation is that someone with a slipping or degenerating disc is often told they have “degenerative disc disease” or “disc disease.” But it is not a disease. The condition is misnamed. A hurt disc is a simple, mechanical injury that can heal, if you just stop grinding it and physically pushing it out of place. It will heal and stop pressing on nerves. The disc pain and sciatica will go away. It is simple, and depends a great deal on how you hold your body when sitting, bending, and exercising. Disc injury is not a life sentence. Disc degeneration or slippage (herniation) can heal and stop hurting- if you let it - no differently than a sprained ankle. Stop damaging your discs with bad bending, standing, and sitting habits and your discs can heal. It takes years to herniate a disc, and only days to weeks to let it heal it by stopping bad habits. A person may be in great pain from simple damaging bending and movement habits. They may go for an x-ray or MRI, and the scans show a degenerating or herniated disc. The pain may not be from the disc, but from the strained, tired muscles from bad habits. Just like car tires that are mid-life, but perfectly good, some wear may show on exam — but may be unrelated to the pain. Pain is falsely ascribed to the disc. Pain continues, but from the poor mechanics. This is no mystery. Change the bad habits to change the pain. Sometimes, people go for surgery for the “bad disc.” But their pain persists or returns— because they never corrected the bad mechanics that caused the pain. Or they may herniate another disc for the same reasons they herniated the first one — bad sitting and lifting and all the other bad habits that they did not easily change. First thing in the morning, don’t sit on the edge of the bed. Instead of sitting and rounding your back, turn over and lie face down. Prop gently on elbows, but not so high that it strains. It should feel good and help you start your day with straighter positioning. Get out of bed without sitting. Sit without rounding. Don’t be ramrod straight or hold your muscles tightly. Just hold a comfortable, natural, straight position. Stand and carry loads without forward head, or rounding your low back. (Don’t lean backward either, to “balance” the weight — that causes problems of its own. Just use your muscles to stand straight. Count how many times you bend each day. For most people, it will be several hundreds of times a day. Imagine the injury to your back by bending wrong that many times each day. Lift using the lunge or squat, not bending over. Don’t use bad knees as an excuse to wreck your back. Bending properly will strengthen your knees as well. Or you can use “the Golfer’s pickup” where you raise the back leg and rest your arm on the front leg. Raise computer monitor off the desk - use a low shelf or phone books. - Move your TV up higher. Stop curling downward and forward to watch. Move desk and car seats closer to sit back not forward (don’t worry about having to keep feet on floor or “flat thighs”). Move keyboard off “below desk” tray, and back up on the desk. Use a lumbar roll (jacket or towel will do) to pad the backward-rounding space in most chair backs. Sit up and lean slightly back. Don’t round against the lumbar roll. More about this later. Use your muscles, not joints to hold you up. It’s free exercise. Don’t do bad exercises (described below)—Use good exercises to retrain bending habits and how to position your body in healthy ways when moving around (described below). Many people hurt from excessive forward bending. Unfortunately, many exercises they do for their back often involves more forward bending: toe touches, knee to chest, and crunches. It is important to strengthen the muscles that pull the back the other way. These are the extension exercises (to follow). Bend properly for everything, even the water fountain, to pick things up from the floor, to look in the refrigerator, or take things out of the dishwasher. Keep your torso upright and bend your knees. Keep your knees over your feet, not slumping forward, which is hard on the knees. Don’t stretch by bending over at the waist without supporting your body weight on your hands. Many people are surprised to find that they injure their back doing forward yoga stretches. You wouldn’t pick up a package that way. Strengthening and stretching are crucial, but alone will not change posture or lifting habits, and so cannot “cure” back pain or posture problems. Many contribute to the original problem of over rounding and bad posture. Back exercises are supposed to be used to retrain you how you hold your body all the time. Doing exercises for back pain is not like getting a shot of penicillin or going to confession. It does not “fix” bad habits the rest of the time. One common example is doing “pelvic tilts,” then walking away, letting your back flop into any old bad posture, instead of keeping the proper tilt you just practiced. Back exercises are supposed to be used to retrain your thinking and habits when you get back up off the floor. This does not happen automatically. This is where many people have missed the point of back exercises. Strengthening has no effect on posture if you don’t apply the strength the rest of the day to control joint angles for all activities. Back pain exercises are misunderstood. People often injure their back all day then hope to fix it with a few exercises. They don’t understand when this does not work. They lie on the floor to do exercises, then stand up and walk away with no use of the positioning or strength they just practiced. It is like eating butter and sugar all day, then doing 10 minutes of exercises and wondering why it doesn’t “work.” The key is what you do all day. Try a small number of these exercises slowly. See how you feel the next day, then increase. Use these back exercises to retrain how to stand, sit and move all day. Lunge. You know not to bend wrong to pick things up, but you do it. Every day. Hundreds of times a day. Instead, bend your knees. You already know that. But most people don’t do it because their legs are too weak. The lunge exercise retrains bending habits and gives you free leg and back exercise at the same time: Bend properly using the lunge for all the many dozens of times you bend every day. Keep front knee over ankle (left) not forward (right). Keep front knee over ankle (left) not forward (right). Stand up, feet apart. Slide one foot comfortably back, keeping foot straight not turned out. Tuck your hip under to reduce the arch in your back, and to stretch back hip. Don’t lean back. Bend your knees to dip to the floor without touching the floor. If you can’t dip all the way down, at least dip a few inches. Don’t let your front knee come forward. Keep front knee over ankle. Don’t arch your back. Tip your hip under to prevent arching and straighten your posture. Don’t lean back. This is a great exercise to strengthen your legs and practice proper bending and lifting posture. You already know you should use your legs like this to bend and lift. Now you will be strong enough to do it. - Upper back extension. Most people stretch their back by forward rounding but never strengthen the back muscles that hold the back upright. Lower back extension. This is another important exercise to strengthen the back and practice extending the hip. Lie face down, hands under your chin or wherever comfortable. Gently lift both legs upward, knees straight. Don’t yank or force. Don’t pinch the low back, just use lower body muscles. Lower back extension - Isometric abs. A major purpose of your abs is to hold your back in position when you are standing up. But many people allow their back to sway or arch too much. They may do “exercises” for this by lying on the floor or standing against the wall and pressing the low back (pelvic tilt) to reduce the curve. But that does not change your positioning the rest of the time, and so, does not heal the back pain. You are supposed to use the tilt when standing to keep your back in position - preventing arching. This exercise strengthens your abs and back at the same time you retrain how to hold your back without arching. Keep your low back from arching even against moving resistance, simulating real life activity when standing up. Lie face up, arms overhead on floor, biceps by your ears. - Press your low back toward the floor to remove the arch. You will feel your abdominal muscles working to prevent your back from arching. Hold hand weights an inch above the floor, without arching your back. Keep your low back against the floor by using ab muscles to straighten your spine. As you get better at this, gradually straighten your legs so that you can practice posture the way you need it for standing up - spine held at healthy position without bending knees. This is how your abs should work all the time, when standing up, to prevent too much arching. Use this exercise to practice using your abs to control the posture of your back, even against moving resistance, simulating real life activity when standing up. Notice that you don’t need to tighten your abs to do this. Just use ab muscles, like any other muscles, to move your body to healthy position. Hold a push-up position. 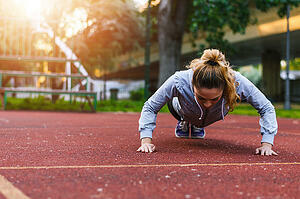 In a push-up position (hands and toes, not on knees) tuck your hips under so that your back doesn’t arch. You will immediately feel your abs working when you do this. You will also immediately feel the pressure in your back disappear, that was caused by arching. The purpose of this exercise is to train your abs at the same time you relearn how to hold your back when you are standing up. Keep your back straight, not letting it sag into an arch like a hammock. Tuck hips as if you were starting a crunch, but don’t hike your behind up in the air or drop your head. Make your posture as straight as if you were standing up. Use a mirror, if available, to see yourself and learn what healthy position feels like. Use this new healthy position all the time, particularly when you stand and reach overhead. Don’t let your back arch to reach overhead. Use the principle of this tuck exercise. Tuck your hips under to remove the low back arch. You will immediately feel your abs working and pressure gone from your back. Tight hamstrings are commonly accepted to contribute to back pain. The irony is that many hamstring stretches are done in ways that round and strain the back and squash discs. Leaning over at the waist for toe-touches does stretch your back and hamstrings, and may feel good, but it is terrible for your back. This is true even for yoga stretches where you bend over at the waist without supporting on your hands. You know never to bend over like that to pick things up. It doesn’t magically become good for you by calling it a stretch. Lie on your back and hold one leg in the air, keeping shoulders, head, and hip flat on the floor and back straight. Keep your other leg straight and flat against the floor too. If the front of your hip is too tight, your bottom leg may rise along with your top leg. To fix this common problem, stretch the front of your hip using the lunge. When Walking and Exercising - Walk with feet parallel, not turned in or out. Weight on sole, not arches. - Walk, move, exercise and sit down with shock absorption. For more on how to avoid bad exercises that contribute to back pain, click here Summary A herniated or degenerating disc is not a mysterious “condition” or a disease. People spend their day sitting, working, walking, and driving in the very hunched posture that pushes discs out the back. They hunch over the computer, lifting and bending wrong all day, walking heavily, and slouching all day, and then exercise in ways that strain and pressure discs and muscles. They do yoga and Pilates exercises that forcibly pressure discs. They try remedies that do not address the cause of the problem, do physical therapy in ways that exacerbates the original problem, give up favorite activities, have surgery then return to previous injurious habits, then everyone is astonished that they “tried everything and nothing seemed to work.” It’s like eating butter and sugar all day, then waving your hands in the air for 5 minutes and saying “I don’t understands why I don’t lose weight, I do my exercises.” How is your body positioning right now? Use your muscles to stand and bend properly for all daily tasks. Bonus: It burns calories, strengthens, and is a free workout. Watch other people’s posture, gait, and movement habits. Notice injurious postures doing “fitness and health” moves featured in fitness magazines. Notice your own habits. Use principles learned in this article to identify and eliminate the cause of your own pain. To learn to stretch the way you really need, learn why stretches can harm, and to feel better about stretching, read this stretching article. Books The Ab Revolution™ No More Crunches! No More Back Pain! by Dr. Jolie Bookspan. Expanded second edition. Revolutionary core training method that involves no crunches. Combines sports medicine with fun exercise to get a workout at the same time that you retrain your muscles for healthy movement for ordinary daily activities. Burn more calories and get incredible abs. 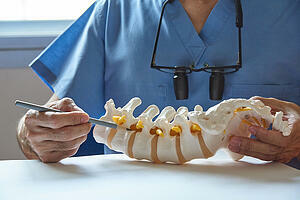 Used by military, law enforcement, and the nation’s top spine docs.